Right now, skateboard decks seem to be a good place to look for some cool retro artwork. 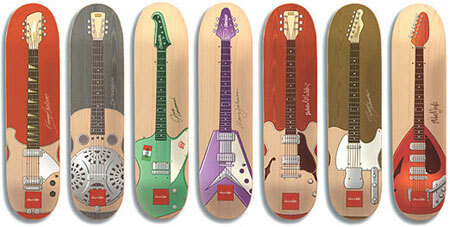 While we wait for the hisknibs-designed skateboards next year, check out these retro guitar skateboards from Evan Hecox. Renowned US artist/illustrator Hecox has designed these decks for skateboard firm Chocolate. All feature a classic guitar model – I’ll certainly be picking up the Vox Teardrop guitar. The one drawback is finding them for sale – so far I haven’t seen them in any stores or retailing online. But when they appear, they’re likely to retail for around £50.